This course is an introduction to symbolic logic. The course is designed to give students an understanding of the logical structure of sentences, the nature of arguments and theories, logical consequence, validity, and the method of refutation by counterexample. There are six homework assignments (68 points), a midterm examination (10 points), a final examination (10 points), and six debriefing sessions (12 points). The grades for these assignments sum to determine the letter grade for the course: A+ (100-97), A (96-94), A- (93-90), B+ (89-87), B (86-84), B- (83-80), C+ (79-77), C (76-70), D (69-60), E (59-0). There is no possibility for extra credit, but I am happy to help students with independent projects. Late work will not be accepted without good reason. Incompletes are given only to accommodate serious illnesses and family emergencies, which must be adequately documented. 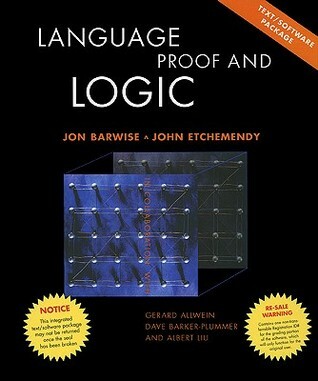 The required textbook for the course is Language, Proof, and Logic, 2nd Edition by Dave Barker-Plummer, Jon Barwise, and John Etchmendy. The book comes in both a "paperless" and "physical" package. The paperless package downloads to your computer. The physical package is the one you can touch. Both packages come with the necessary software, including Grade Grinder. Grade Grinder is an online grading service required for the course. You must buy the book new (in either the paperless or physical package) to have access to Grade Grinder. For helpful information, visit the homepage for the book, the store, the FAQ page, the hints and solutions to selected exercises, and notes for a logic course based on the book. "[Y]ou can always do a trail submission to see if you got the answers right, asking that the results be sent just to you. When you are satisfied with your solutions, submit the files again, asking that the results be sent to the instructor too" (10). If you want a high grade in the course, you should take this advice. Try not to send your homework to the instructor until your answers are right! You increase your chances if you do not leave your homework to the last minute. With only a few exceptions, the homework assignments are not difficult. They all, however, take time to understand and complete. Keep in mind also that the book contains more exercises than those assigned for homework. If you want a deep understanding of logic, you should do as many of them as possible.